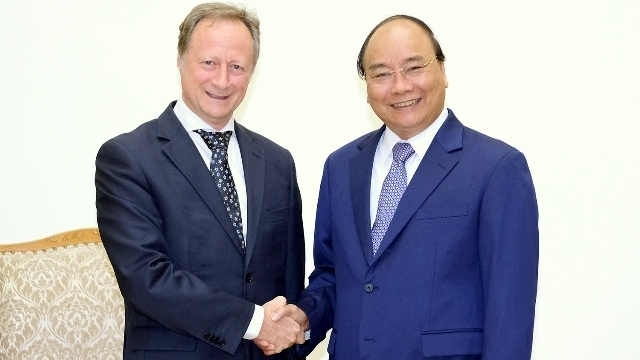 Prime Minister Nguyen Xuan Phuc has said Vietnam treasures its cooperation with the European Union (EU) and expressed his hope that the EU-Vietnam Free Trade Agreement (EVFTA) will be signed soon. At a reception in Hanoi on May 28 for Ambassador Bruno Angelet, Head of the EU Delegation to Vietnam, the PM spoke highly of the EU delegation’s coordination in successfully organising the Meet Europe 2018 conference. He expressed his belief that after the conference, cooperation between Vietnamese localities and European partners and businesses will be strongly promoted, contributing to deepening the relations between Vietnam and the EU and its member countries. Bruno Angelet proposed several measures to foster bilateral ties, including moves towards the signing of the EVFTA, the implementation of the Partnership and Cooperation Agreement (PCA), and the European Commission (EC)’s “yellow card” warning to Vietnam related to the fight against illegal, unreported and unregulated (IUU) fishing. He said he wishes that the two sides will exert every effort to sign the EVFTA later this year. An EU delegation had a ten-day working trip to Vietnam and spoke highly of Vietnam’s recent efforts to deal with IUU fishing, the ambassador said, adding that the EU is ready to support Vietnam in this issue. PM Phuc informed his guest that Vietnam’s relevant agencies have made every effort to respond to the EC’s “yellow card” warning. On the basis of the EU delegation’s assessments, the Vietnamese side will continue taking positive and strong measures including closely controlling fishing vessels, ensuring the location of any boat’s fishing position, providing modern equipment for fishing vessels, enhancing communication work and raising fishermen’s awareness, as well as strictly punishing any violations, he affirmed. He voiced his belief that stronger changes will be seen in this field in the near future. Regarding the PCA, the Government leader stated that Vietnam will strengthen collaboration with the EU to realise this agreement.